Lend a hand, share and care... For a true friend is quite rare! This friendship day we bring to you a perfect blend of fun and learning, with activities for kindergarten, grade 1, grade 2 and grade 3 kids. Partner up with your friends in making and exchanging friendship bands. These engaging and attractive worksheets feature tasks to glue pictures, search words, connect the dots, color the pictures, riddles and much more. 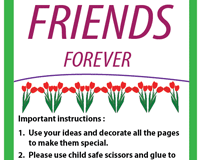 Make everlasting memories with your friends, collect pictures of the good times shared with them and glue them onto the scrapbook provided here. Write about your friend, a day spent with them or an interesting incident. Cut along the dotted lines to make friendship bands and exchange them with your friends. Enrich your vocabulary with this literacy exercise of finding the hidden words horizontally, vertically and diagonally. 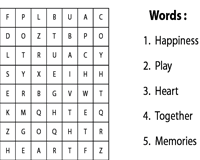 Reinforce positive social skills with this friendship themed worksheet. Join the dots, complete and color the picture that emerges with these, print-ready activity worksheets. Sharpen the eye-hand coordination, and fine motor skills of the kids as they learn to sequence numbers from 1-30. 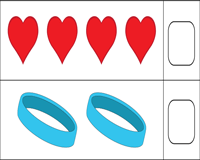 Reinforce the concept of one-to-one correspondence between numbers and their actual count with these, count the pictures worksheets. Ensure the kids touch the pictures and count to improve accuracy. 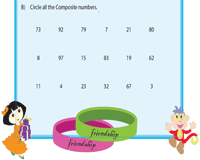 Review the concept of prime and composite numbers with this worksheet. Use the divisibility test to identify the prime and composite numbers from the given set of numbers and circle them. Track down the odd and even numbers in the given worksheet. Circle odd numbers in Part A and even numbers in Part B. 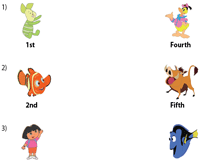 Pair up the cartoons with their friends as you match the ordinal numbers with their names in this set of vibrant and engaging ordinal number worksheets. 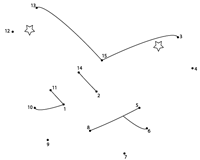 Subtract the numbers and map the answers to the respective letters and decode the solution for the riddle featured in this worksheet.